The restaurant and dish discovery app space is getting crowded. In fact, I won’t write about another app unless it is powered by some innovative technology or employs interesting ways to acquire users and/or data. 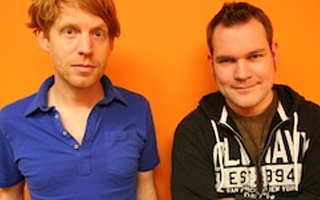 Which is exactly why I wanted to interview Forkly co-founder Brady Becker. 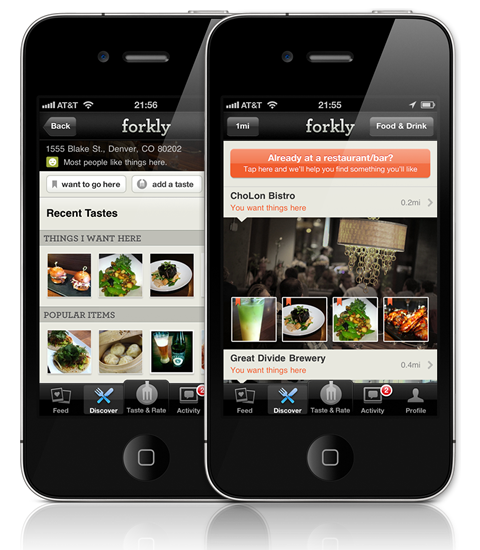 Forkly is a mobile app that helps you discover food and drink based on your personal taste-graph. While this may sound a lot like Food Genius, Forkly offers interesting tools for bloggers, restaurants, and brands that differentiate them for others in this space. They are hoping these tools will make the platform interesting on its own as they build their user base. For restaurants they offer analytics, customer contact, menu, and social media tools. For brands they offer brand pages and influencer tracking. For bloggers they offer tools for embedding your tastes in your blog and gaining influencer points. ReadWriteWeb’s Marshall Kirkpatrick brought up an excellent point in his post about the site’s launch- how will Forkly deal with the Cold Start problem? I am curious to see how they manage this as well. They are smart to create an ecosystem of services, which should ultimately make diner acquisition much easier. With regards to restaurants, however, these tools put them squarely in competition with the deluge of other sites like OpenMenu, Seamless, AllMenus, and Real Time Farms, trying to get restaurants to upload their menus and keep them current. Brand acquisition will also be challenging until they are able to get a critical mass using the app. It will definitely be interesting to follow as Becker and Co-founder Martin May develop the business. I got a chance to catch up with Becker to learn more about Forkly. DG: What is the inspiration behind Forkly? Brady Becker: We were fed up with the current solutions around trying to find places to eat and drink. Sifting through reviews was to much effort, especially on the go, and food photo sharing apps didn’t provide enough utility around actually finding good stuff to eat/drink. No solutions understood personal tastes very well. These frustrations inspired us to build something that we would want to use. We’re firm believers in, “eating our own dog food”. Solving problems we encounter in the real world is what we’re passionate about. DG: Why do people need a new “way to share and discover your dining tastes, meanwhile enabling an ongoing conversation around items you’ve tasted”? How does the site work and what differentiates it from other restaurant and dish recommendation sites? BB: There are a plethora of food apps who are focusing on the photo. In Forkly, the photos are optional; we’re all about capturing your tastes and making use of those opinions. If a photo exists or was provided by the restaurant we’ll use that one, with the option to add your own. By focusing on your likes and dislikes, Forkly helps you discover new places and will show you “what’s good” once you’re there. We’re calling this set of taste relationships your “taste-graph”, and it’s at the core of what powers Forkly. DG: What is your business model? BB: For both brands and restaurants we’re building tools that use the taste graph to help them understand those who draw the most influence, allows them track it through the social graph and market where it counts the most. Forkly allows restaurants to understand their patrons tastes so they can deliver the best possible experience. We plan to monetize features within these tools. DG: You offer tools for bloggers, restaurants, and brands. How did you determine what tools to offer? We’re working with a few restaurants and brands to understand their needs and inform the tools we’re creating for them. For example, one of our restaurant partners Cholon Bistro is using the Forkly to power the menu on their site, complete with official photos and influencer information. Users signed in on Forkly can “want” items directly from their website. For an example check out Cholon and click on an item in the menu. This is the tip of the iceberg, the aim is for restaurants to use Forkly data to improve their reach and better understand their customers. One of the first tools we’re providing for bloggers is the ability to embed a taste. Similar to a YouTube video, anyone can embed their taste cards into a blog. Users logged in on Forkly can “want” embedded items, and easily find them later when they’re hungry. Wanted items add to a users influence on Forkly. Embedding is good way to syndicate tastes and increase individual influence within Forkly. Expect to see more features and tighter integration with blogging platforms in the future. Here’s an example of an embedded taste you can check out the Momentum of Failure blog. DG: Do these tools enhance your recommendation algorithm? If so, how? Not exactly, the recommendations are primarily based on the taste graph. However, we’ve discussed allowing restaurants to mark certain items as suggested or favored, which we would take into account if the items matched your tastes. DG: ReadWriteWeb’s Marshall Kirkpatrick brought up an excellent point in his post about Forkly launch, “I’ll be curious to see how the service deals with the Cold Start problem.” How do you plan on dealing with this problem? BB: Our previous startup Brightkite (acquired in 2009) was also a data driven startup. We’re employing many similar tactics to in growing Forkly. For example making the product compelling on it own, without a large network or lots of data. Of course the features that require data become much better as the network grows. DG: What challenges have you faced as a data-driven startup? BB: Overcoming the previously mentioned cold-start problem. DG: Do you have any plans to release an API? BB: We’re looking into an API but still working out the details. DG: What excites you most about food and tech? BB: We’re excited to see restaurants come out of the “dark ages” i.e., no more flash intros, personalized menus, mobile tab payments etc.. We’re also excited about the emerging tools that give people the ability make informed decisions about what they’re eating, where it came from, what’s in it, how they’ll like it, etc..